After slumbering for four years, Nuketown Radio Active returns to find a world transformed. In this show I’ll get up to speed on what’s changed around the ol’thermonuclear burg, and what you can expect to see in the future. I talk about the role-playing games and video games I’m currently playing, and introduce the audience to my family’s newest project: raising a Seeing Eye puppy named Hank. I’m a married 45-year-old geek dad with two kids (StarGirl, 13, and NeutronLad, 10). I’m the director of web development at a small liberal arts college, which means I do far more project management than programming. I’m the Cubmaster for my son’s Cub Scout pack and I coach his baseball team in the spring. Still writing for Knights of the Dinner Table! My family and I are raising a Seeing Eye puppy named Hank. But more on that later. Somethings are the same but different. 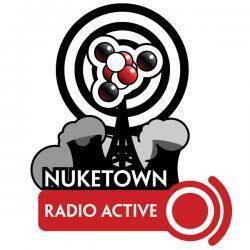 On Radio Active #86, I’d just redesigned Nuketown and gone from Drupal 6 to 7. This time, I’ve redesigned Nuketown and gone from Drupal 7 to WordPress … a far greater leap. Entire site has been overhauled and every post has been touched — sometimes for light editing, other times for updated or new photos. Your podcast promo could be here! Send it to nuketown@gmail.com. RPGs: Four years ago we were playing Pathfinder. Now we have two “playtest” D&D 5th Edition games going … and we’re loving it. Also run Savage Worlds from time to time. Consoles: The Xbox 360 has been supplanted by an Xbox One (though the old 360 dinosaur is still around). The Playstation 3 up and died one day and was replaced by a PS4. Xbox One: Playing Fallout 4 in Survival mode and Gears of War 3. PS4: Just finished Uncharted 4, looking forward to Mass Effect: Andromeda. Conventions: I’m going to MEPACon Spring 2017 in Scranton, Pa. It’s our regions biannual convention, and always a good time. Yep. We’ve got space for TWO promos. Send yours to nuketown@gmail.com. My family and I are raising Hank, a male golden retriever/Labrador retriever mix, for the Seeing Eye. The Seeing Eye, based out of Morristown, N.J., raises and trains guide dogs for the blind and visually impaired. I got into it because my parents raised 3 when I was a kid. Took two years to convince our kids this would be fun (they didn’t want to give up the puppy). We have the puppies for a year, training them in basic obedience and socialization. Hank is our second puppy; we raised Olaf, a male German Shepherd, the first time around. It’s a tremendous amount of work, but it’s also a lot of fun. The dogs go to a lot of interesting places (airports, baseball games, bowling alleys, etc.) and usually spend several days a week with me at work. Audio and text comments always welcome! Podcast promos especially needed!